My second trip to 北海道 (Hokkaido, Japan) was in February to attend winter festivals, and East to see the Russian islands disputed by Japan. I landed with François for three full days in the cold evening of Thursday 31 January (-14°C) and took-off on 04 February morning; 亮 (Ryo) stayed a bit shorter. François and I immediately savoured a great cheese fondue at the bar STAX in 釧路 (Kushiro) then slept at ラビスタ釧路川 (La Vista Kushirogawa hotel), which features an outdoor spa with a nice view over the city. Friday, we enjoyed a gorgeous breakfast at the hotel then rented a Nissan car, very useful due to the rarity of local buses and trains. Driving was a pleasure: very nice machine, very nice shapes, and very nice pink :) The sea on the way to 納沙布 (Nosappu) was frozen and white near the coast but fluid and blue beyond. On arrival, we heard the gravel-like sound of icy waves. The Russian islands called 北方領土 (Hopporyodo) by the Japanese were clearly visible thanks to the dry winter air, and we got a worthy aerial view from an observation tower after a short walk. On our way back to the city, we admired the sunset and spotted impressive herds of deers walking in the snow. We met 亮 (Ryo) in 釧路 (Kushiro), checked the ice and snow statues of 釧路氷祭 (Kushiro ice festival) then dined at the funny 七人の小人 (The Seven Dwarves) and finished with a cheese fondue at the bar STAX. On Saturday, we composed our breakfast at the fish market, filling rice bowls with our preferred raw fish, shells and eggs, which was expensive but good with crab soup. We then returned to the park to see the statues in daylight, where I was impressed by the ice statue of Pegasus. A short drive then led us to a huge cemetery by the sea, with Buddhist, Christian and 神道 (Shinto) tombs. After lunch, we drove to 阿寒湖 (Lake Akan), with a stop to drink hot local milk. We dined at ホテル阿寒湖荘 (Hotel Akankoso) then watched fireworks of 阿寒湖氷上フェスティバル (Akan ice festival) from the nearby frozen lake before relaxing at 木の香 (Fragrance of trees) outdoor spa, where the cold air was breath-taking. Sunday, we enjoyed a snowy road on our way to 摩周湖 (Lake Mashu), a splendid UNESCO world heritage site, where I could watch shadows and reflections all day long. 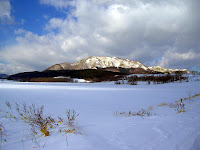 However, we had planned to see red-crested cranes and thus moved to 釧路湿原国立公園 (Kushiro shitsugen national park), where wild animals are visible in vast flat lands using binoculars. We quickly spotted deers on a frozen river but not cranes. However, a local recommended us a nearby spot called 鶴見台 (Tsurumi-dai) where we observed huge groups of wild red-crested cranes eating, singing and flying. Satisfied but cold, we drank delicious hot chocolates and discussed our adventures at the nearby どれみふぁ空 (Do-re-mi-fa-so-la). After driving 亮 (Ryo) to the airport, everything seemed over but François and I continued with a delicious dinner at 焼肉つすみ (Korean barbecue Tsurumi), and a drink at a local jazz bar that turned out to be great!